New Mexico Compound Residents Accused Of Planning Terrorist Attacks The search for a missing child led to a raid of a rural compound and the grisly discovery of 11 emaciated children. Their relatives were training to attack U.S. personnel, federal authorities say. A ramshackle compound in the desert area of Amalia, N.M. Five former residents were indicted on terrorism and gun charges. 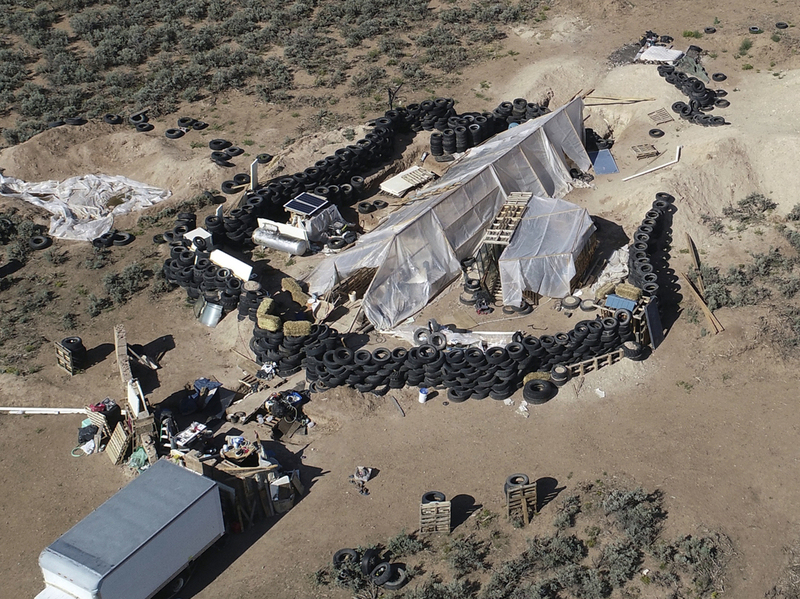 A federal grand jury in Albuquerque has indicted five residents of a rural New Mexico compound on new terrorism-related charges connected to an alleged conspiracy to attack FBI and military personnel. The five defendants were arrested last year after authorities found 11 malnourished children living in squalor in the small community of Amalia, near the New Mexico-Colorado border. They also discovered a large cache of weapons, leading to charges of conspiracy and illegal possession of firearms. The superseding indictment announced Thursday charges Jany Leveille, 36; Siraj Ibn Wahhaj, 40; Hujrah Wahhaj, 38; Subhanah Wahhaj, 36; and Lucas Morton, 41; with a conspiracy to provide material support for terrorist attacks on federal officers and employees. "The indictment alleges that the defendants conspired to provide material support in preparation for violent attacks against federal law enforcement officers and members of the military," said Assistant Attorney General John C. Demers in a statement. "Advancing beliefs through terror and violence has no place in America, and the National Security Division continues to make protecting against terrorism its top priority." Attorneys for the defendants withheld comment, saying that they are waiting for more information from the government. "We still don't have all the documents from the government regarding this case," said Amy Sirignano, who represents Morton, as quoted by The Associated Press. Sirignano said in an email sent to the AP on behalf of the defense that their clients would plead not guilty when they are arraigned next week. Four of the compound residents also are charged with kidnapping a child who later died. The remains of a small child were discovered three days after the initial raid. The boy, 3-year-old Abdul-Ghani Wahhaj, was the son of defendant Siraj Ibn Wahhaj and had been reported missing from his home in Georgia since December 2017. The search for the child led the FBI to begin monitoring the group and to the eventual raid. New Mexico state child abuse charges were dismissed last year when prosecutors mishandled the case. "Federal prosecutors say that between Dec. 2017 and August 2018, the group, who are either siblings or related by marriage, had 'a common plan to prepare for violent attacks on government, military, educational and financial institutions,' " NPR's Vanessa Romo reported in September 2018. "According to the superseding indictment, Siraj Ibn Wahhaj and Hujrah Wahhaj gathered firearms and ammunition, and all of the defendants transported people, firearms, and ammunition across state lines and constructed a training compound where they stored firearms and ammunition. The superseding indictment further alleges that Siraj Ibn Wahhaj and Morton constructed and maintained a firing range at the compound where they engaged in firearms and tactical training for other compound occupants, and that Leveille and Morton attempted to recruit others to their cause. "The superseding indictment also charges Leveille, Siraj Ibn Wahhaj, and Morton with conspiring to attack and kill officers and employees of the United States, in violation of 18 U.S.C. § 1117. It was a part and an object of the conspiracy that the defendants would kill officers and employees of the United States, specifically, Federal Bureau of Investigation employees, government officials, and military personnel."